The After Night Falls Slot by Betsoft Gaming is a video slot with 30 fixed profit lines. Like many Betsoft slots, After Night Falls has 3D effects. You play with a wonderful slot in a great setting. The main character is a detective who wants to catch a jewel thief. You can win up to £1.550.000 on this hunt! In addition to great animations, this game also boasts a whole host of bonus features: Scatters, Wilds, x10 Multiplayer Free Spins, the 5 Rooms Click Me Feature, the Stacked Collapsing Wins Feature, the Granny Bonus Feature and the Double Up Feature. Moving Wild Feature: There is no normal wild symbol at After Night Falls, but Moving Wild. This turns up on the last reel and wanders to the left in the following spins. Each of these spins is free and gives good profits! You even can get more moving wilds during this feature. Five Rooms Click Me Feature: The Criminal Scatter is the symbol with the criminal on it (ok, you’re gonna find it). You three or more symbols with this nice guy and the feature starts. Pick now each one of five doors for the criminal to enter. Behind every door is a cash prize! Stacked Collapsing Wins: You certainly will not find this feature on every slot. To activate it you need 3 equal symbols on one reel. Then you win with a 3x multiplier and two of the three symbols will be replaced by new symbols. This gives you another chance to win. Granny Bonus Feature: This feature is also very entertaining. You start the Granny Feature when three Granny symbols appear on reels 1,3 and 5. Then the detective goes in search and investigates crime scenes. Just click where you want to search and you’ll get extra winnings. Free Spins Feature: Of course, there is also a Free Spins feature on After Night Falls. If you land three, four or five office scatters on your reels, you get 10, 15 or 25 free spins. With every spin, you have a win multiplier of 2 to 10 times your normal win! 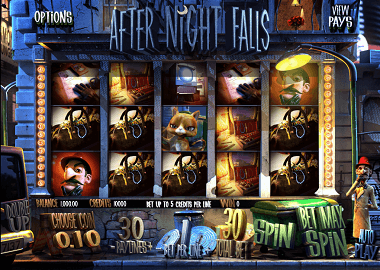 The After Night Falls Slot by Betsoft has a Return to Player of 97.27%. With this theoretical value, you only play if you activate all 30 paylines. You can already play from £ 0.02 per payline and the maximum is £150 on all paylines. The Top Award on the After Night Falls is £1.550.000. You can play the After Night Falls when you click on the banner above. Below are a number of UK online casinos where you can find Betsoft games. No matter where you play, we can promise you fantastic animations and lots of action!